In December of 2015 we began replacing the old manual meters with radio read meters. This will assure accurate recordings of water usage and equitable billings. We are strategically replacing these in blocks. We will notify you when we get to your neighborhood by an insert in your bill or a door hanger. Once you are notified that we are installing in your neighborhood please call us to set up an appointment. Our staff will need access to your home for a 30 – 45 minute appointment. Why do we need this meter reading equipment upgrade? - This system allows meters to be read electronically. Each radio frequency remote transmits the reading to a receiving device located in a GWSD vehicle. The reading information is then transferred to the utility billing system for statement generation. Each remote has a unique ID that insures that only your reading is being assigned to your account. Please note that these signals are low-powered and will not interfere with signals of other electronic devices. How much will this upgrade cost me? -There is no charge for the upgraded equipment, or if your meter requires replacement. -The reading equipment upgrade does not affect how much water is logged as your water use. If a new meter is required, depending on age and accuracy of your existing meter, your bill could change. 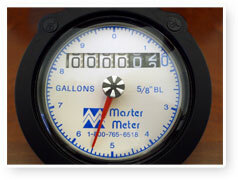 As meters age, they tend to run slower over time, actually under registering the amount of water being used. The new meter will simply record consumption more accurately. Do other homes in my neighborhood have this meter reading technology? -Several water meters on homes in your neighbor already use this technology. Completing the upgrade at your home will allow a meter reader to use the mobile vehicle unit to collect all meter readings in your area versus having to walk house-to-house. Who will install the upgraded equipment? -Genesee Water and Sanitation staff will be performing the upgrade in your area. They will have the appropriate photo identification and identifying them as GWSD employees. If you would like to confirm that the staff member is working for GWSD, please call us at 303-278-9780. Will my water service be interrupted during the installation? -Most customers will not have service interrupted. However homes that have older meters may require a full installation of a new meter as well as the transmitting device. If this is the case, the Genesee Water and Sanitation employee performing the installation will inform you before your service is temporarily interrupted to ensure minimum impact to you. What if there is a leak at the meter or any problem after the equipment is upgraded? -Please call Genesee Water and Sanitation District at 303-278-9780.